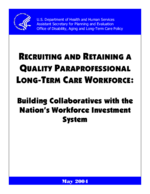 This report was prepared under contract #HHS-100-03-0009 between the U.S. Department of Health and Human Services (HHS), Office of Disability, Aging and Long-Term Care Policy (DALTCP) and the Institute for the Future of Aging Services. For additional information about the study, you may visit the DALTCP home page at http://aspe.hhs.gov or contact the ASPE Project Officer, Andreas Frank, at HHS/ASPE/DALTCP, Room 424E, H.H. Humphrey Building, 200 Independence Avenue, SW, Washington, DC 20201. His e-mail address is: Andreas.Frank@hhs.gov. This paper was prepared for the national symposium Pathway to the Future: How Workforce Development and Quality Jobs Can Promote Quality Care, May 23-25, 2004. Opinions expressed are those of the authors and do not necessarily reflect those of the U.S. Department of Health and Human Services or the U.S. Department of Labor. This paper sets the stage for an ongoing conversation between representatives of the long-term care sector and the workforce investment system. The long-term care sector provides care to chronically ill, disabled, and elderly persons in a variety of care settings such as individual homes, residential care, nursing homes, and other institutional settings. Long-term care consists of an array of services and supports for persons with functional limitations whose needs range from limited personal assistance to total care. The workforce investment system supports both employers and workers by providing -- at the local level -- labor market information, job placement services, and training. This conversation is critically important for our nation. In 1995, there were approximately 12.1 million long-term care recipients in the United States (Kaiser Foundation, 1999.) As the baby boom generation ages and technological advances extend life, these numbers will grow rapidly in the coming decades. The elderly population in the United States is expected to increase by over 130 percent between 2000 and 2050 (ASPE, 2003). Much of the formal care for these populations is provided by paraprofessional workers: certified nurse assistants (CNAs), home health aides, and personal and home care aides. For a variety of reasons described later in this paper, there is a growing shortage of these workers. In addition to the care needs of our nations elderly and disabled population, there is an economic imperative to support the viability of long-term care services. Spending on institutional and home care for adults -- including Medicare, Medicaid, private long-term care insurance, family resources, and other payers -- is expected to more than double between 2000 and 2025, from $98 billion to $208 billion. By 2050, spending is projected to reach $380 billion (ASPE/Lewin, 2001). The majority of long-term care is provided by unpaid, informal caregivers. Often, formal long-term care services support the care provided by informal caregivers -- typically adult children -- enabling some informal caregivers to enter paid work. Exploring the costs of informal caregiving to employers, MetLife (1997) found that the cost to business through lost productivity as a result of informal caregiving is over $11 billion per year. In short, developing a long-term care paraprofessional workforce is an economic development issue for communities and individuals. The workforce investment system is well-positioned, through its network of One-Stop Career Centers, to serve as a valuable resource for both long-term care providers and workers. This paper provides the fundamental context of both the long-term care sector and the workforce investment system in order to build understanding among members of each system. It is not intended to be comprehensive but to provide enough information to stimulate dialogue. Section II briefly describes the characteristics of the long-term care paraprofessional workforce. Section III outlines the growth in the long-term care sector. Section IV discusses workforce shortages from an economic perspective and why they exist in the long-term care sector. Section V describes the response of the long-term care sector to the shortage of paraprofessionals. Section VI describes the Workforce Investment Act (WIA) and the role of the workforce system. Section VII provides some examples of workforce investment initiatives in the long-term care sector. Finally, Section VIII presents some opportunities for collaboration. There are over 2.5 million paraprofessional long-term care and health care workers in the United States. As Table 1 indicates, the U.S. Department of Labors Bureau of Labor Statistics (BLS) data has three occupational categories that include long-term care paraprofessionals: (1) nurse aides, orderlies, and attendants; (2) home health aides; and (3) personal and home care aides. These workers are employed in both long-term care and acute care settings. While they all provide personal care, they have varying levels of supervision, education, and training requirements. SOURCE: U.S. Department of Labor, Bureau of Labor Statistics (2004). Occupational Outlook Handbook, 2004-2005 Edition. Washington, DC. Employment numbers from U.S. Department of Labor, Bureau of Labor Statistics. 2002-2012 National Employment Matrix. Table 2 describes the characteristics of nurse aides in different settings (e.g., nursing home, hospital) compared with other workers. As the table indicates, nurse aides in long-term care settings are more likely than their counterparts in hospitals to: have a high school education or less, be unmarried with children, have an income below the poverty level, be uninsured, and receive Food Stamps. When compared with all workers, nurse aides in long-term care settings are disproportionately female, African-American, less educated, unmarried parents, poor, uninsured, and receiving Food Stamps (GAO, 2001). SOURCE: U.S. General Accounting Office (2001). Nursing Workforce: Recruitment and Retention of Nurses and Nurse Aides is a Growing Concern. GAO-01-750T. Washington, DC. Among the three long-term care paraprofessional occupations presented in Table 1, nurse aides, orderlies, and attendants had the highest median hourly earnings ($9.59) in 2002. The median annual earnings for this labor category were $19,960. Wages for nurse aides vary based on the industry setting. The average hourly wages of nurse aides working in hospitals are over one dollar more than their counterparts in community care facilities for the elderly. Median annual nurse aide wages, however, are lower than the median wages for all short-term training occupations ($21,911) (DOL, 2002). The median hourly and annual earnings for home health aides were $8.70 and $18,090, respectively. The hourly and annual earnings for personal and home care aides were the lowest of the three occupations ($7.81 and $16,250, respectively) (DOL, 2002). According to BLS, paraprofessionals generally receive better benefits if they work in a hospital or nursing home as opposed to in home care. For example, nurse aides in hospitals usually qualify for at least one week of paid vacation after one year of service. They are often eligible for medical insurance, pension plans, paid holidays, and sick leave (DOL, 2004). As Table 2 indicates, nurse aides who work in hospitals were more likely to be insured than those in home health care settings or nursing homes. By comparison, personal and home care aides and home health aides are less likely to receive benefits. They are usually on-call hourly workers, and they are only paid for time spent working in the home (DOL, 2004). Benefits are also associated with the number of hours worked. Ong et al. (2002) conducted a labor market analysis of California caregivers, including personal and home care aides, home health aides, and nurse aides. One area explored was benefits. The study found that most full-time employees -- but few part-time ones -- were offered benefits.1 Most full-time employees were offered vacation time (ranging from 65 percent of home health aides to 95 percent of nurse aides) and sick leave (50 percent to 85 percent). Among part-time workers, the proportion offered vacation time ranged from 10 percent (personal and home care aides) to 30 percent (nurse aides); sick leave was also less common (ranging from 15 percent to 35 percent). The majority of full-time nurse aides and home health aides, and almost half of personal and home care aides, were offered medical and dental insurance, compared with less than one-third of part-time workers (Ong et al., 2002). The lack of benefits for part-time employees potentially affects a large segment of the paraprofessional workforce. About 30 percent of nurse aides are part-time workers. However, the majority of home health aides and personal and home care aides (over 60 percent) are part-time or temporary employees (Ong et al., 2002). Between 2000 and 2050, the number of Americans in need of long-term care is predicted to increase about 110 percent, from 13 million to 27 million. A number of factors will contribute to this growth, chief among them the increase in the elderly population, particularly those age 85 and older, and fewer available informal caregivers. The elderly population segment will increase by over 130 percent, from 8 million in 2000 to 19 million in 2050. The growth in the need for care is driving the demand for long-term care workers (ASPE, 2003). The strong projected growth in home health aides and personal and home care aides reflects a trend in the long-term care system in which services are increasingly provided in home and community-based settings. As noted earlier, these occupations have lower wages and are less likely to receive benefits. SOURCE: U.S. Department of Labor, Bureau of Labor Statistics. 2002-2012 National Employment Matrix. Washington, DC. While demand for paraprofessionals is growing rapidly, the field faces a major problem with turnover. According to GAO (2001), turnover among nurses aides working for home health care agencies and nursing homes is 13 to 18 percent higher than the overall labor force and 20 percent higher than other service workers. Researchers have suggested a number of factors that contribute to above-average turnover rates among paraprofessionals. GAO (2001) highlights substantial physical demands and workplace dangers as factors in high turnover rates. For example, the report notes that nursing homes have a higher rate of workplace injury (13 per 100 employees in 1999) than the construction industry (8 per 100 employees). A survey of home care workers in New York reports that low wages was the most common reason the respondents gave for quitting their last home care job; workers also cited irregular work schedules and lack of benefits and potential for advancement (Long Term Care Policy Coordinating Council, 1990). Research also suggests that employers can reduce turnover by making workers feel more involved in decision-making. For example, Banaszak-Holl and Hines (1996) found that turnover among aides in nursing homes was significantly reduced by aides involvement in interdisciplinary care plan meetings. High caseloads are also a factor. It is difficult to establish hard numbers because the extent to which turnover data on paraprofessionals for one or more long-term care settings is collected and analyzed using uniform methodology varies tremendously. However, researchers have generally found that turnover rates typically exceed 50 percent (e.g., National Center for Health Workforce Analyses, 2004; PHI and NCDHHS, 2004; GAO, 2001; Stone, 2001). The term labor shortage has no universally agreed upon definition. In this paper, we will adopt DOLs (1993) slightly modified version of Franke and Sobels (1970) definition: A sustained market disequilibrium between supply and demand in which the quantity of workers demanded exceeds the supply available and willing to work at the prevailing wage and working conditions at a particular place and point in time. The presence of a market disequilibrium is not an unusual occurrence -- in fact, disequilibria are important for markets to function, as they send signals that affect prices as well as the quantity supplied and demanded. Much of the economics literature defines labor shortages based on sustained increases in demand that continue at a pace that prevents labor supply from ever catching up. There are, however, other reasons for a shortage of workers. A series of case studies examining labor shortages (DOL, 1993) show how government regulation and institutional rigidities can lead to shortages in some instances. In particular, a shortage can arise when government restrictions prevent the labor market from accommodating an increase of demand; essentially, the government regulations may lead to a temporary disequilibrium becoming a chronic labor shortage. In addition, when consumers are legally entitled to services, from public or private insurance, a shortage can be inferred by failure to provide such services. Using both direct confirmation and indirect evidence, shortages of long-term care workers have been identified in a number of studies (e.g., Barnow et al., 1998; DOL, 1993; GAO, 2001; Stone, 2001; Stone and Wiener, 2001). Long-term care occupations might appear to be an unlikely candidate for a shortage. The jobs require short-term training and relatively few technical skills. Thus, under ordinary circumstances, a disequilibrium could be eliminated by increasing wages and inducing workers to enter the field. However, recent studies indicate that shortages do exist and are marked by recruitment and retention problems. These problems can both contribute to and be symptoms of shortages. For example, a survey of state Medicaid and aging officials conducted in 1999 found that 42 states reported paraprofessional recruitment and/or retention problems. State-level surveys also indicate significant problems. For example, a survey of long-term care providers in Pennsylvania found that 70 percent reported significant recruitment or retention problems. In Massachusetts, nursing home administrators reported an 11 percent frontline worker vacancy rate in 1999 (Stone and Wiener, 2001). A 2001 survey of 155 non-for-profit nursing homes, continuing care retirement communities, and assisted living facilities in California indicated that recruitment was a serious or somewhat serious problem for 77 percent of respondents, while retention was a serious or somewhat serious problem for 56 percent (Harahan et al, 2003). Other evidence of shortages includes high worker caseloads and the reliance of some nursing homes on contracted staff from home health agencies. However, employers in the long-term care industry often lack the flexibility of other employers. Stone and Wiener (2001) show that the long-term care industry depends to a large extent on government and other third party payments that restrict providers ability to adjust wages (and other factors that influence their costs) freely. The Medicaid and Medicare programs paid for over one-half of expenditures in the industry in 1995, 37.8 percent and 17.8 percent, respectively, and Medicaid finances about two-thirds of nursing home residents. Stone and Wiener (2001, pg 18) also note that: For years states have tried to control Medicaid nursing home and home care expenditures by placing limits on reimbursement. Providers have, in the past, used Medicare to make up the difference, but Medicare cuts (Balanced Budget Act of 1997) make this difficult by requiring that reimbursement limits be held to below-inflation rate growth (Stone and Wiener, 2001). Under such circumstances, employers lack the ability to increase wages and take other actions that would alleviate the shortage. According to Better Jobs Better Care, a Robert Wood Johnson-funded initiative, numerous factors contribute to the difficulty in recruiting and retaining paraprofessionals. Wages are generally low and benefits are poor. Job preparation, continuing education, and training frequently fail to prepare these workers for what they face in caring for people with increasingly complex needs. Advancement opportunities are often limited. Paraprofessionals report that they often do not feel valued or respected by their employers and supervisors. Despite having more interaction with patients than many other members of the care team, these workers are often excluded from decision-making involving patient care. The long-term care sector is trying a number of approaches for dealing with these problems. Broadly speaking, they involve efforts to improve wages and benefits, create opportunities for advancement (e.g., career ladders), and to improve the workplace environment. The major approaches described in the literature are outlined below (Stone and Wiener, 2001). Provider initiatives that enhance recruitment and retention. Examples include signing bonuses, retention and referral bonuses, annual raises, subsidized child care, and tuition assistance. Wage pass-through. As noted above, Medicaid and Medicare reimbursement policies affect the wages of paraprofessional workers. Some states have attempted to increase wages through a wage pass-through (WPT) policy. Under a WPT, some portion of a reimbursement increase for a public source (e.g., Medicaid) is earmarked for increased wages or benefits for front-line workers. A 2003 Paraprofessional Healthcare Institute (PHI) report found mixed results in 21 states that have implemented WPT. Since 2000, there have been formal evaluations of three states WPT programs. Although the evaluations found signs of improved wages and/or reduction in turnover, the PHI (2003) report suggests that current data has not made a strong case for the efficacy of these programs. Health insurance coverage. As noted above, many paraprofessional workers lack medical insurance. Lack of health insurance may discourage workers from entering long-term care jobs or staying in them. Thus, some states are exploring how to expand health insurance coverage. New York, for example, authorized the establishment of a state-funded initiative to cover uninsured home care workers in selected parts of the state. Transportation subsidies. Home health aides and personal and home care aides spend considerable time traveling from one location to another. Washington State, for example, will reimburse agencies for this commuting time. Career ladders. States and health care providers have created career ladders to encourage workers to enter long-term care jobs and advance within the field (e.g., moving from a CNA to an LPN). For example, Massachusetts developed the Extended Care Career Ladder Initiative in response to the high turnover and vacancies among paraprofessionals (including CNAs) in long-term care facilities (including nursing homes). Providers are partnering with other organizations (e.g., community colleges, unions, community-based organizations, workforce investment agencies) to mount demonstrations. Training. As noted above, the Federal government requires CNAs to receive 75 hours of training to be certified. About one-third of states mandate extra hours for CNA training. Training could involve basic skills and job supports or specialized training in Alzheimers and related dementias. Wellspring, a consortium of nursing homes, initiated management change and job redesign. CNAs are part of care teams and are empowered to make decisions that affect quality of life for residents and workers. A nurse practitioner was hired to develop a series of clinical and management training modules and serves as a liaison between management and nursing staff. All staff receive intensive offsite training. Some providers created programs where more senior CNAs mentor or orient new CNAs. Achieve, an employer-focused demonstration program in Cleveland, aims to increase retention among paraprofessionals by developing a more supportive workplace environment. Achieve is providing frontline supervisory training, lunch and learn education sessions for workers, and on-site case management services for paraprofessional workers. Case managers help paraprofessionals obtain work supports (e.g., transportation, child care) and are available to discuss work-related issues (e.g., problems with supervisors or co-workers) or other issues. Achieve is operated by Towards Employment, a private, non-profit organization. The Workforce Investment Act (WIA) was enacted in 1998 to create a more coordinated, locally-driven workforce investment system.5 WIA is administered by the U.S. Department of Labor (DOL). Funds are allocated by formula to states, and most of the funds are then distributed to local workforce investment areas by a similar formula. WIA has three funding streams: adult, dislocated workers, and youth. WIA was intended to give states and local areas more control over their programs while, at the same time, establishing a core set of performance standards by which to judge programs. The WIA legislation included several features that influence the WIA systems ability to help alleviate the shortage of long-term care workers. First, the legislation required that local areas use One-Stop Career Centers to provide services to workers and employers. Second, the law requires, with some exceptions, that One-Stop Career Center customers receive training through voucher-like mechanisms called individual training accounts (ITAs). Third, vendors must place their programs on the states eligible provider list (EPL) for customers to be permitted to use their ITAs with the vendor. Finally, states and local areas are subject to performance standards that can result in rewards or sanctions depending on how well they do. In the following sections, the WIA system is described, with particular attention to the issues that affect local programs ability to work with the long-term care industry to help alleviate shortages. The WIA legislation is currently up for reauthorization. Although both the House and Senate have passed bills, no conference committee has been appointed, and action is considered unlikely this year. The reauthorization may change features such as the type of funding streams, sequencing of services, and rules for the eligible provider lists. WIA gives the business community a prominent role in workforce investment activities at both the state and local levels. At the state level, workforce investment activities are coordinated by state Workforce Investment Boards (WIBs), whose members are appointed by the governor. The majority of the WIB is composed of business representatives. Other members include state legislators, local elected officials, state agency representatives (e.g., employment security), and representatives of other workforce investment constituencies. At the local level, WIA services are provided through local WIBs. These WIBs are appointed by chief elected officials and include representatives of businesses, educational institutions, unions, community-based organizations, economic development agencies, and other One-Stop Career Center partners. The local WIB is responsible for selecting the One-Stop Career Center operator and designating its partners. Through increased local control, WIA aims to strengthen local economies through the development of workforce investment programs that address the specific needs of area businesses and job seekers. Grounded in strong local partnerships, these programs are intended to build training capacity, link customers to supportive services, provide quality employment services, and serve as a resource for local employers. WIA mandates the One-Stop Career Center approach to workforce investment. One-Stop Career Centers are required to provide clients with core employment-related services and access to intensive services and training. They can be operated by a number of different entities. Possible operators include: city or county governments, for-profit contractors, nonprofits, community-based organizations, unions, and consortia of organizations. WIA lists a number of mandatory One-Stop Career Center partners: vocational rehabilitation, Wagner-Peyser Act funded programs (i.e., the employment service), adult education and family literacy, postsecondary vocational education, veterans services, and unemployment insurance. The legislation also makes reference to optional partners such as the Temporary Assistance for Needy Families (TANF) program and food stamps employment and training programs. The WIA statute intends for One-Stop Career Centers to provide the entire community with a full range of workforce investment-related services. In addition to providing services to dislocated workers, adults, and youth job seekers, One-Stop Career Centers can provide valuable services to employers. One-Stop Career Centers can refer, recruit, and screen job applicants for employers that are hiring. Businesses that are new to an area might use their facilities to interview prospective employees. Buck (2002) notes that One-Stop Career Centers can give businesses information about federal tax credit programs for hiring disadvantaged workers (e.g., the Work Opportunity Tax Credit). They can work with employers to develop customized training programs to prevent lay-offs or ensure that there is an adequately skilled workforce to fill job openings. With the increased emphasis that WIA puts on labor market information, One-Stop Career Centers can be a valuable resource to employers looking to gain a better understanding of local economic conditions and characteristics of the labor force as well as workers who want to select an appropriate career. Some One-Stop Career Centers have employer representatives who serve as a point-of-contact for businesses in the community and work to ensure that employers are taking full advantage of the services available. One-Stop Career Centers provide three levels of services to customers -- core services, intensive services, and training. One-Stop Career Centers are required to provide core services on-site. Intensive services can either be provided by the One-Stop Career Center or by outside providers upon a referral from the One-Stop Career Center. Table 4 lists some of the core and intensive services available to clients. Core services are available to the entire community with no restrictions based on income or employment status. Intensive services and training are available to any individual who needs services to obtain or retain employment that leads to self-sufficiency. Clients can only enroll in training programs that provide them training in a demand occupation, as determined by the states labor market information unit. WIA created Individual Training Accounts (ITAs) that allow eligible individuals to enroll with the training provider of their choice. They differ from a pure voucher because local WIBs can, and generally do, put restrictions on how the ITA may be used. Many local WIBs have maximum time and dollar amounts for their ITAs. In addition, some programs further restrict the ITAs by requiring customers to use the lowest cost vendor for their program of interest and/or not allowing customers to enroll in programs where they are unlikely to be successful for any reason including insufficient demand for the skills offered in the program. ITAs are not required for customized training, OJT, training for special populations, and in situations where there are insufficient providers. States are responsible for certifying a list of eligible training providers from which customers can choose. The list is based on providers placement and wage performance for WIA customers and all customers. The list is organized by specific vocational program, so an individual provider can have one or more programs on the list. Local areas can set additional requirements for providers to be eligible to serve their customers. In a study of WIA implementation, Buck (2002) found that data commonly requested by local WIBs as part of the certification process included: program completion rates; unsubsidized employment rates; wages; retention rates; and licensure and certification rates. Given their presence on state and local WIBs, employers are in the position to offer input into the eligible training provider list and occupations approved for training. WIAs performance accountability system sets goals for the adult, dislocated worker, and youth programs. The state WIB negotiates the expected level of performance with DOL, and local WIBs negotiate their expected performance with the state WIB. The performance measures for the adult and dislocated worker programs include: entered employment, employment retention, wage gain, and educational/credential attainment. The goals for the youth program are similar, but also include: attainment of a high school diploma; basic skills attainment, occupational skills attainment; work readiness; placement and retention in postsecondary educational training, apprenticeships, the military, or employment.6 WIA authorizes the Secretary of DOL to award incentive grants to states for exceeding performance targets and to penalize states that fail to meet their goals in two consecutive years. There are numerous examples of workforce investment initiatives designed to recruit, retain, and foster advancement among workers in the long-term care sector. A few examples are described below. Phase I, a labor market study of workforce supply and demand, included an assessment of industry and occupational information, demographic information, and employment and training resources. The study identified health care (including long-term care) as a target industry with high growth, easy entry, and career mobility. Phase II was creation of an ad-hoc consortium of health and long-term care providers, training providers, and government agencies. The group met quarterly and defined a response to problems facing the health care sector in Delaware County. The consortium developed: (1) Directory of Healthcare Training Providers for use by job seekers, guidance counselors, employment training programs, welfare- and WIB-funded programs, schools, social service agencies, and community colleges; (2) Day Care/Transportation/Healthcare Employer Map for use by job seekers to find support services near employers. Phase III was reduction of direct care vacancies and turnover through a CNA training program. The program targets youth ages 18 to 21 with at least one barrier to employment. It is organized into four components -- employability skills training (e.g., employer expectations) provided by a local community college; literacy/documentation skills, also provided by the community college; career coaching and case management, provided by Womens Association for Womens Alternatives; and a 90-hour training curriculum provided by the community college and Fair Acres Geriatric Center. The California Caregiver Training Initiative (CTI) awarded grants to 12 Regional Collaboratives to address shortages in the health care workforce. Each grant was for an 18 to 21 month period. The target audience of the initiative was primarily recruited from local WIA programs (approximately 70 percent of participants) and Welfare-to-Work clients (roughly 30 percent).7 The state wanted grantees to develop programs to recruit, train, and retrain healthcare workers while attempting to enhance their earning potential. Most of the collaboratives were headed by local WIBs; prominent partners included employers (e.g., local hospitals, nursing homes), unions, community and four-year colleges, and various community-based organizations (Matthias et al., 2002). Californias Employment Development Department is administering CTIs $25 million budget. Part of the Governors Aging with Dignity Initiative, CTI funding comes from a combination of state and federal agencies. The UCLA School of Public Policy and Social Research and the Center for Health Professions at the University of California at San Francisco are conducting the evaluation. The Process and Implementation Evaluation gives an overview of the efforts of each of the collaboratives and highlighted initial successes and barriers the grantees faced (Matthias et al., 2002). The report focuses on activities related to recruitment and training. One of the primary goals of CTI was to improve recruitment efforts. A number of the collaboratives experienced success in recruiting non-traditional populations (e.g., migrant farm workers, non-English speaking home care workers) for caregiver positions. Despite the need for English as a Second Language (ESL) training for some of these potential workers, the collaboratives found that many of these individuals were well-suited to the field due to prior healthcare experience. Recruitment efforts also focused on developing enhanced screening tools to ensure that potential applicants would be able to adjust to a caregiver occupation. The researchers found that, when developing new training programs, sites that had previous experience working with state licensing boards had an advantage because of their ability to get quick approval for these programs. The collaboratives had access to a coordinated regional training system that was able to meet students diverse needs -- in large part, because of the strong presence of workforce investment. Students benefited from a combination of intensive case management and the availability of a wide array of training approaches. Many students were particularly pleased with the fast-track training courses they took. The report also stressed the value of being able to use CTI funds for support services for students enrolled in training. However, the availability of some of the most vital services (i.e., transportation and childcare) services varied across sites. Mennonite Village -- a continuing care retirement community in Albany, Oregon -- recognizes the unique challenges associated with working in a long-term care setting and the importance of limiting turnover. In 2003, Mennonite Village had a turnover rate of 16 percent, well below typical rates within the industry. Mennonite Village limits turnover by emphasizing educational opportunities for staff, providing competitive salaries and good benefits packages, and creating an environment where employees are appreciated. Through an employee scholarship program, eligible employees can apply for funds to take up to two years of college classes at the local community college while working at Mennonite Village. Employees are also eligible for nursing scholarships of up to three years. To further assist with employees academic aspirations, Mennonite Village offers on-site college counseling and flexible schedules that allow employees to balance academics with work commitments. There are also numerous in-service and other formalized training opportunities for employees. For example, Mennonite Village holds an annual CNA seminar. Activities are partially supported by the DOL Employment and Training Administration. Mennonite Village offers competitive salaries and benefits (100 percent of medical, dental, and vision benefits for full-time employees and 50 percent for part-time workers). In addition, Mennonite Village established an Employee Assistance Fund to provide a safety net for employees facing short-term financial crises. Managers and administrators try to make employees feel appreciated, such as using a group decision-making process so that all employees views are taken into account. High-performing employees are acknowledged (e.g., the CEO seeks out employees that have been praised by residents and their families). Also, a staff appreciation committee searches for ways to make the work experience more enjoyable. Recruitment. DCGA conducts community-wide recruitment to attract a wide spectrum of potential caregivers. The recruitment process includes intensive screening to ensure that potential trainees are committed to providing quality services. Education. DCGA offers a 200 hour, 12 week comprehensive training in preparation for state CNA certification. DCGA has a 89 percent training retention rate and a 93 percent pass rate on the state CNA certification test. The original curriculum development was funded by the Arizona Department of Commerce. In addition, the Tucson city government supports the training through Community Development Block Grant funding provided by the U.S. Department of Housing and Urban Development. DCGA makes some referrals of prospective trainees to One-Stop Career Centers for financial aid for occupational training. Although training funds available through the WIB have been limited in recent years, some trainees have received ITA funding. Placement. Graduates of the training have an 86 percent employment rate. Workers average post-training wages are more than three dollars per hour higher than their pre-training earnings. DCGA works to place trainees in situations that offer room for advancement. For example, approximately one-quarter of trainees will express interest in becoming nurses. Because these trainees can rarely afford this training, DCGA tries to place them with employers that offer educational benefits. Post-employment services. After placement, workers can access social support and continuing education services through their employers or DCGAs Caregiver Resource Center. DCGA offers over 120 hours of continuing education each year. The Resource Center is supported through a partnership with Goodwill Industries and the city of Tucson. DCGA has made a concerted effort to strengthen its relationship with local workforce investment agencies, attempting to demonstrate to the local WIB the importance of building the long-term care workforce and the advancement opportunities within the field. For example, DCGA recently applied for funding to facilitate increased collaboration between One-Stop Career Centers and community-based organizations. In addition, DCGA and the local One-Stop Career Center, developed a joint strategy to strengthen their relationship. The long-term care sector and the workforce investment system have mutual interests. The long-term care sector is seeking to recruit and retain qualified paraprofessionals to provide quality services. The workforce investment system is seeking to identify and focus resources on high demand, high growth sectors in order to both meet the labor force needs of those sectors and channel resources toward the preparation of workers for jobs that offer them opportunities for sustained employment with good wages and benefits. The health sector has been identified nationally by DOL as a high growth area. Advertise job openings. One-Stop Career Centers link employers and workers through the on-line Americas Job Bank, which lists job vacancies nationwide. The workforce system can conduct outreach with employers to learn about vacancies. At the same time, providers can contact one-stop career centers as openings arise. Participate on state and local Workforce Investment Boards. Decisions with regard to priorities and allocation of resources are made by the WIBs. The state WIB sets broad priorities for the state, while the local WIB makes the key decisions locally. Workforce investment can encourage employers to participate on WIBs and long-term care providers can actively seek to become members. Encourage local WIBs to make long-term care training a priority and to include training programs on the eligible provider list. Long-term care providers and other stakeholders should be prepared to address some obstacles. For one, in some states there is a burden on the vendors/trainers to maintain the data required to be on the eligible provider list. In addition, some states and local areas might not allow training for long-term care jobs because of the low wages. The long-term care industry will need to stress that although the wages are initially low, the training costs are also low; this will be important for the new common performance measure on efficiency. Promote on-the-job training and customized training. Workforce investment and long-term care providers should work collaboratively to develop sectoral strategies, customized training, and on-the-job training. Employers can overcome the restrictions on Individual Training Accounts and the eligible provider list by agreeing to offer training on-site at the workplace. This may also be very attractive to paraprofessional workers looking to upgrade their skills who often have challenging personal schedules. Identify and work with employer intermediary organizations to recruit, train, and support staff. There are many skilled intermediary organizations that can be a resource to long-term care providers as they seek to recruit, train, and retain staff. Many of these organizations have experience with the workforce system as well as special populations who can be an important source of labor for the sector. Explore avenues for making jobs more attractive. This paper presents examples of steps employers can take to develop a supportive workplace environment for paraprofessionals such as training, management redesign and career ladders. These practices can reduce turnover and enable employers to attract and retain their workers. Assistant Secretary for Planning and Evaluation, U.S. Department of Health and Human Services and The Lewin Group (2001). Published in Long-Term Care: Consumers, Providers, and Financing: A Chart Book. Washington, DC: The Urban Institute. Assistant Secretary for Planning and Evaluation, U.S. Department of Health and Human Services (2003). Report to Congress: The Future Supply of Long-Term Care Workers in Relation to the Aging Baby Boom Generation. Washington, DC. http://aspe.hhs.gov/daltcp/reports/ltcwork.htm. Banaszak-Holl, J. and Hines, M.A. (1996). Factors Associated with Nursing Home Staff Turnover, The Gerontologist, 36(4): 512-17. Barnow, B. and King, C. (2003). The Workforce Investment Act in Eight States: Overview of Findings from a Field Network Study. Interim Report. Albany, NY: Nelson Rockefeller Institute of Government. Barnow, B., Trutko, J., & Lerman, R. (1998). Skill Mismatches and Worker Shortages: The Problem and Appropriate Responses. The Urban Institute, submitted to Office of the Assistant Secretary for Policy, U.S. Department of Labor. Bell, S.H. and Orr, L.L. (1994). Is Subsidized Employment Cost Effective for Welfare Recipients? Experimental Evidence from Seven State Demonstrations. The Journal of Human Resources, 29(1): 42-61. Buck, M.L. (2002). Charting New Territory: Early Implementation of the Workforce Investment Act. New York: Public/Private Ventures. Franke, W. and Sobel, S (1970). The Shortage of Skilled and Technical Workers. Lexington, MA: Heath-Lexington Books. Harahan, M. F., Kiefer, K. M., Burns Johnson, A., Guiliano, J., Bowers, B., & Stone, R. I. (2003). Addressing Shortages in the Direct Care Workforce: The Recruitment and Retention Practices of Californias Not-for-Profit Nursing Homes, Continuing Care Retirement Communities and Assisted Living Facilities. California Association of Homes and Services for the Aging and The Institute for the Future of Aging Services. The Henry J. Kaiser Foundation (1999). Long-term Care: Medicaid's Role and Challenges. Publication #2172. Washington, DC. Institute for the Future of Aging Services. Better Jobs Better Care: The Long-Term Care Workforce Crisis. Retrieved April 26, 2004, from http://www.bjbc.org/page.asp?pgID=31. Matthias, R., Morrison, E., Chapman, S., & Benjamin, A.E. (2002). Caregiver Training Initiative Process and Implementation Evaluation. Community Service Projects/Papers: Paper 08. Los Angeles: The Ralph and Goldy Lewis Center for Regional Policy Studies. Metropolitan Life Insurance Company (1997). The MetLife Study of Employer Costs for Working Caregivers. New York: Metropolitan Life Insurance Company. National Center for Health Workforce Analyses (2004). Nursing Aides, Home Health Aides, and Related Health Care Occupations: National and Local Workforce Shortages and Associated Data Needs. Washington, DC: U.S. Department of Health and Human Services, Health Resources and Services Administration. New York State Long Term Care Policy Coordinating Council, Survey of Home Care Workers (1990). Strengthening the Home Care Work Force in New York State: A Study of Worker Characteristics, Recruitment, and Retention. Ong, P., Rickles, J., Matthias, R., & Benjamin, A.E. (2002). California Caregivers: Final Labor Market Analysis. Community Service Projects/Papers: Paper 07. Los Angeles: The Ralph and Goldy Lewis Center for Regional Policy Studies. Paraprofessional Healthcare Institute and the Institute for the Future of Aging Services (2003). State Wage Pass-Through Legislation: An Analysis. Workforce Strategies No. 1. Washington, DC: Paraprofessional Healthcare Institute. Paraprofessional Healthcare Institute and the North Carolina Department of Health and Human Services Office of Long Term Care (2004). Results of the 2003 National Survey of State Initiatives on the Long-Term Care Direct-Care Workforce. Raleigh, NC: North Carolina Department of Health and Human Services Office of Long Term Care. Raynor, C. (2003). Federal Workforce Development Programs: A New Opportunity for Long-Term Care Workers. Washington, DC: Institute for the Future of Aging Services. http://aspe.hhs.gov/daltcp/reports/fedwfdp.htm. Stone, R.I. (2001). Long-Term Care Workforce Shortages: Impact on Families. Policy Brief No. 3. Washington, DC: Family Caregiver Alliance. Stone, R. I., with Weiner, J. A (2001). Who Will Care for Us? Addressing the Long-Term Care. Washington, DC: The Urban Institute and the American Association of Homes and Services for Aging. http://aspe.hhs.gov/daltcp/reports/ltcwf.pdf. U.S. General Accounting Office (2002). Long-Term Care: Aging Baby Boom Generation will Increase Demand and Burden on Federal and State Budgets. GAO-02-544T. Washington, DC. U.S. General Accounting Office (2001). Nursing Workforce: Recruitment and Retention of Nurses and Nurse Aides is a Growing Concern. GAO-01-750T. Washington, DC. U.S. Department of Labor, Bureau of Labor Statistics (2004). Occupational Outlook Handbook, 2004-2005 Edition. Washington, DC. U.S. Department of Labor, Bureau of Labor Statistics. 2002-2012 National Employment Matrix. Washington, DC. U.S. Department of Labor, Bureau of Labor Statistics (2002). Occupational Employment Statistics Survey, 2002. Washington, DC. U.S. Department of Labor, Employment and Training Administration (1993). Labor Shortage Case Studies. Research and Evaluation Report Series 93-E. Washington, DC. The study reported benefits offered, as opposed to benefit take-up rates. BLS figures likely undercount the number of current workers. BLS data is based on wage and salary employment in residential care, personal care facilities, home health care services, hospitals, temporary help firms and public agencies. Data on self-employed independent providers are collected; however, definitional limitations prevent extracting the subset of workers from these estimates. In this estimate, "direct care workers" refers to both professionals and paraprofessionals. An evaluation by Abt Associates found that the training and work experiences led to reductions in recipients' welfare dependency in all seven states. In six of the seven states, the program had a significant impact on increased earnings for participants (Bell and Orr, 1994). For additional information about the workforce investment system, see Barnow, B. and King, C. (2003). The Workforce Investment Act in Eight States: Overview of Findings from a Field Network Study. Interim Report. Rockefeller Institute of Government. The performance measures for WIA will change as DOL's Employment and Training Administration adopts the common measures developed by the Office of Management and Budget for job training and employment programs. The common measures for adults are entered employment, employment retention in the second and third quarters after first employed, earnings increase from the quarter prior to participation to the first quarter after exit, earnings increase from the first quarter after exit to the third quarter after exit, and efficiency measured as the program appropriation divided by the number of participants. For youth the measures are placement in employment or education, attainment of a degree or certificate, literacy and numeracy gains, and efficiency measured as the program appropriation divided by the number of participants. Welfare-to-Work was a temporary federal program intended to provide employment and training services to long-term welfare recipients and other highly disadvantaged populations.